Four Seasons Resort Maui at Wailea, Hawaii 5.0 out of 5 based on ratings. 2 user reviews. This is luxury. The magnificent open-air lobby faces the ocean and includes three restaurants, a casual bar, a spa, and health club wrapped around a courtyard with fountains, swimming pools, and spa tubs. 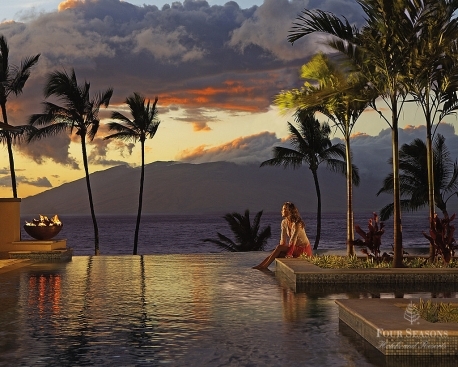 Unforgettable Honeymoons offers the lowest possible rates out there for the Maui Four Seasons! RESORT HIGHLIGHTS: Romantic Cabanas with swimming pool- or ocean-facing lounge chairs include food and beverage service, plus complimentary cool towels, bottled water, and Evian spritzes. The beach concierge offers snorkeling gear at no additional charge. Individual and couples massage treatments are offered in three private thatched-roof huts by the beach. Spago restaurant serves Wolfgang Puck's signature cuisine, and a 21,000-square-foot spa provides a full range of exercise options and relaxation treatments.